Are Location-Based Deals The Wave Of The Future? Late last week group buying service Groupon announced that it would be partnering with the deals service Loopt to bring push-notifications of nearby deals on your phone. Loopt is a service that keeps track of your location at all times, allowing you to "check-in" to particular locations without having to physically open up the application and do so. The service also allows you to manually check-in if you're not quite ready to constantly share your location with the service, and tells you about deals in the area. The Groupon partnership will bring Groupon's new Groupon Now service to Loopt. Currently Groupon Now is only available in Chicago (where Groupon is headquartered), with plans to extend support to other locations soon. Groupon Now is a location-based version of Groupon that offers you location-based deals based on where you are. The limited-time deals can be activated by merchants whenever they are having a slow night, or have empty tables, as a way to drum up extra business. With the new partnership, Loopt will also see those deals and send them out to all Loopt users in the area, letting them know there are bargains to be had. The idea is a pretty interesting one. I'm a semi-regular Groupon purchaser, and was pretty enthusiastic about the prospect of Groupon Now. I do a decent amount of traveling, it would be nice to be able to catch a deal at a location while I'm away from home, or be out with friends one night and see a bargain for dinner downtown or tickets to an event. 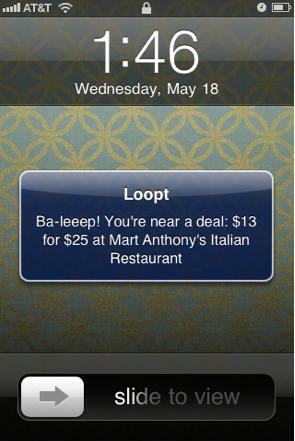 With Groupon Now I would have to launch the application specifically looking for bargains – with Loopt, not so much. Sure you can turn push notifications off, or just not use either service – but I'm not sure how thrilled I would be with constant advertisements hitting my phone for locations near me (which is the entire point of Loopt as a service). In my little town in NC those are gong to be few and far between, but head out one night in Manhattan and I bet it'll be a different story. Tons of companies are getting into the location-based marketing/deals scene, offering bargains when you check-in to locations, visit locations a certain amount of times, or when you advertise where you're at to friends. It's not a new concept, but an interesting one. We're gradually getting to a point where using any location-based service is going to come with marketing for some sort of bargain located nearby. People were up in arms a few weeks ago about their phones keeping track of their location. These services not only know where you are -they're sending you advertising targeted for that area. What do you think about location-based marketing? Do you want to know about all the deals going on around you, or would you rather have to go looking for them?